The Balance Factor: Can You Handle Zero G? Floating around an airplane unhampered by gravity may sound like a blast, but only as long as you take precautions to keep your lunch in your stomach. Passengers planning a trip aboard G-Force One, a commercial aircraft that offers samples of weightlessness for $3,000 a pop, should anticipate motion sickness during their first ride aboard the parabolic-flying plane, according to NASA flight surgeons and researchers studying weightlessness. "If you're only going for one flight, you're risk of motion sickness is going to be high," said Jay Buckey, a medical professor at Darmouth College. "But people's susceptibility varies wildly." Like NASA's KC-135 training aircraft (also known as the "Vomit Comet"), the Zero Gravity Corp.-operated G-Force One plane simulates weightlessness for passengers by alternating between upward climbs and downward dives in a parabolic flight trajectory. During climbs, passengers experience almost twice the pull of Earth's gravity, then snag a few precious gravity-free moments in nosedive that follows, before repeating the process over and over again. "It was just great to be weightless," said Buckey, who not only studies motion sickness and weightlessness but experienced it firsthand aboard the Columbia space shuttle in 1998. "I know we were all sad to come back to gravity." Motion sickness from weightlessness, he told SPACE.com, can mean everything from slight discomfort and drowsiness to the sheer unpleasantness of nausea and vomiting. But while results may vary, the cause can be tracked to a common spot inside the human head. Motion sickness starts with the body's internal balance system, which has adapted itself for use under Earth's gravity (known as 1 g). Inside the human inner ear are three semicircular canals -- part of the vestibular system -- that serve as accelerometers using tiny hairs and fluid to determine the body's position in space. "They tell if you're moving in a pitch, roll and yaw," Buckey said, adding that another organ determines up and down motion. That works fine on the Earth's surface, where the body expects -- and rightly so -- the steady pull of gravity. But during a parabolic flight or the initial days of weightlessness in space, the body's internal balance system is cast into confusion. "Historically, we've found we have a 60 percent incidence of motion sickness," said Dan Fitzpatrick, lead flight surgeon for NASA's KC-135 flight program at the Johnson Space Center, adding that it can sometime reach 80 percent of the plane's passengers. "And it doesn't matter whether they're students or astronauts." 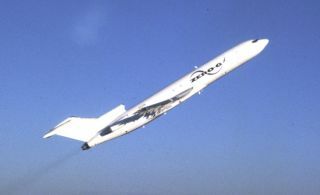 It also doesn't matter whether passengers are floating in a weightless dive or experiencing higher than normal gravity (about 1.8 g) during a climb. Motion sickness can strike at both instances because the inner ear is receiving unexpected information about the local gravity. "Whenever you're in a new or unexpected environment where the usual input from the balance organ doesn't match what you're experiencing, it sets up a feeling to make you sick," Buckey said. Shifting repeatedly between 1.8 g to zero gravity during parabolic flights is "fairly benign" on the human body, said Malcom Cohen, a gravity tolerance researcher at NASA's Ames Research Center. "The thing I'd be worried about is motion sickness." G-Force One passengers can take steps to avoid motion sickness, either through taking medicine or minimizing their movements at the outset of a flight. "You want to ease yourself into it," Fitzpatrick told SPACE.com. "Don't just jump up and start flailing around once you are weightless." Rapid head movements tend to be the number one instigator for motion sickness in the uninitiated, researchers said, adding that the ill feeling can easily be overcome by strapping yourself into a seat for short periods of time. The addition of anti-motion sickness medication prior to take-off can also lower the unpleasant incidence down to about 20 percent during any given KC-135 flight, Fitzpatrick said. Zero Gravity officials say they have taken steps of their own to limit the effects of motion sickness in passengers. According to the company's website, flights will be limited to a maximum of 15 parabolic flights and passengers will not have to confront weightlessness right away. Instead, pilots will make a serious of parabolic maneuvers that subject passengers first to one-third Earth's gravity (equivalent to Mars' gravity), then one-sixth Earth gravity (matching the Moon's pull). G-Force One pilots will also interrupt their parabolic flight plan with several minutes of straight, level flight. "Typically the people who are flying the plane never get [motion] sick," Buckey said, adding that it's very similar to the difference between car drivers and their motion sick passengers. Zero Gravity officials have also said they prescribe light meals low in proteins and dairy products on flight day, and will have a dedicated flight attendant aboard G-Force One to assist any passengers who experience motion sickness. But if a G-Force One passenger does take ill during their flight, chances are still high that they will still enjoy the experience. "Even the people who get really sick on these flights think it's absolutely amazing, with the little bit of fun they've experienced canceling out the bad," Fitzpatrick said. "It's something you never ever get to experience anywhere else."